You have to hand it to the folks at MacFormat. They know how to have their fun. Next Monday Apple will “show their wares” at the Apple Keynote during the WWDC. This is where they not only let developers know about the operating systems and devices that will be coming out soon, but where they make really big announcements. Lately there have been so many leaks there really haven’t been too many huge surprises. And without Steve Jobs, it just isn’t the same. Don’t get me wrong; Tim Cook is great and all, but he just doesn’t have that huge personality that Jobs did. Without him, we need some huge surprises, and there just haven’t been any. We knew about the iPhone 5, nearly every little nuance, and even the iPad Mini. There was nothing left to ooh and aah over. There is certainly more mystery surrounding this year’s Apple Keynote. Mostly this is because nothing seems to be ready like it was supposed to be. There have been several rumors about iPhone 5S, iPhone 6, cheaper iPhones, iRadio, a new iPad, a new iPad mini, etc. Who knows what they’re going to announce? 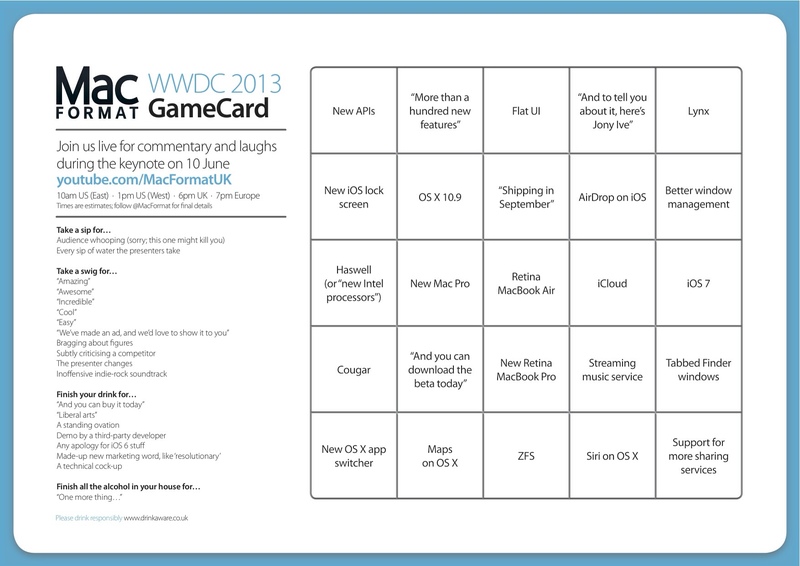 MacFormat wants to make sure we have fun with it, even if there aren’t any big announcements. They created a combination BINGO card/drinking game. Okay, so that requires you drinking at 10 AM if you’re on the west coast. Is that a problem? And if you play along, don’t blame me when you’re passed out before you even find out what that one more thing is.